– … Smoothies bar: check! It’s 8am and the team meets for the briefing. Ok guys, we are ready. Let’s start! The audience started to arrive and a warm welcome of our team and a cup of coffee was waiting for them. The event kick-off was taken care of by our Managing Partner Gert-Jan de Vries. He started his presentation with a short –and charismatic- explanation about the history of the location, a good icebreaker for the event. He provided a company update and the program prepared for that day. 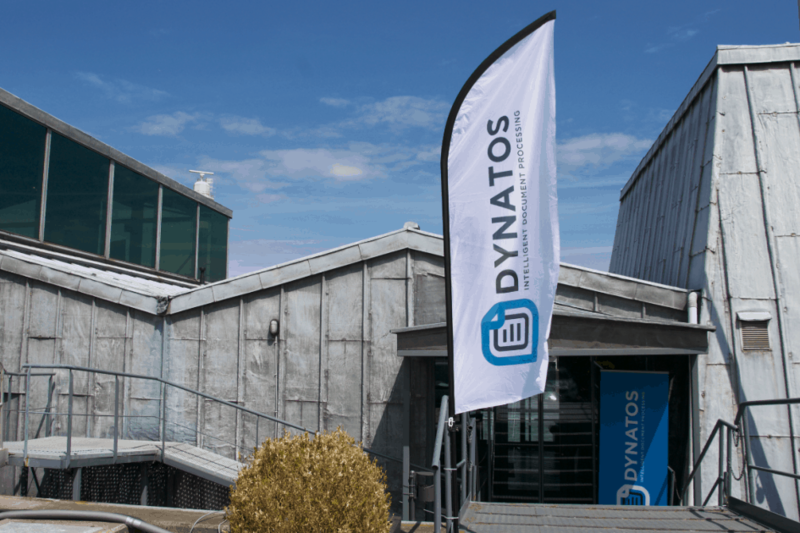 This year, we had an extensive buffet of content for our customers: a case study, a keynote about e-invoicing, an interesting demo about Finance Robotics and last-but-least the breakout sessions provided by our team & guests, related to our new products. What is PEPPOL? And how is the Belgian government preparing for this change? And how is Dynatos cooperating on this project? This and more, is what Lien Wauters-Van der Taelen shared with us during her presentation. Lien Wauters-Van der Talen, together with Johan Van Steenlandt, are responsible for the PEPPOL implementation project in the Flemish Government. They frequently organize roadshows around Flanders where different suppliers are invited and informed about the new way of invoicing via PEPPOL. Suppliers working with institutions related to the government, like schools, universities, hospitals, etc. should prepare to comply the E-invoicing Flemish policy, and being aware that a pdf invoice does not meet that requirement. More information about this project can be found here. “If you work with “Vlaamse Overheid”, Dynatos is your partner to go to.” Lien Wauters-Van der Taelen. Are you looking for a certified PEPPOL access point? Dynatos is the answer! Do not hesitate to contact us via our website. Ludo Van Den Berge, Head Invoices & Expense Notes at BNP Paribas and our senior consultant Yves Raison, presented us the story about the Accounts Payable process at BNP Paribas. Traceability of invoices across different locations, lack of information upon invoice accounting, unnecessary printing of pdf invoices… these were some of the reasons to look for a solution. And that is how Dynatos came onboard. Can you imagine going to the supermarket and being helped by a robot? Well, that is not a Spielberg’s film, it will be the reality in the near future. Sometimes it is difficult to imagine how the world will be with the intervention of Artificial intelligence in our daily tasks. And that was the reason why we included a keynote about robotics this year. Joris Juttmann, Financial Director at KPMG, provided an entertained presentation about the evolution of technology along the years and how robotics will contribute in the automation of financial processes. “Do you remember Commodore 64?”, “Did you use the 5 ¾ diskettes to store some kb’s of information?” He asked. And some of my younger colleagues had no idea what he was talking about. He provided two demos: the first one with a Transactional robot, performing a standard invoice process. Starting from the receipt of the invoice via email till the accounting in the system. And the second one with Amelia, a Cognitive robot. The demo showed us how an episodic memory could drive Amelia to understand -and interpret- the customer’s question in order to take decisions and provide an answer. Even the face of Amelia changed based on the customer’s reaction. Very interesting! But don’t worry, our colleagues from Support team are real! “Are robots the future for transactional tasks, leaving the creativity for humans?”, Joris Juttmann. And that wasn’t all: the day continued with sessions related to subjects such as Enterprise Content Management, Spend Management and Financial Closing. To close the program, we had a walking-lunch in the sun with our customers. Don’t miss out our next Customer Event. We will provide you more content and innovative ideas to improve your financial processes.